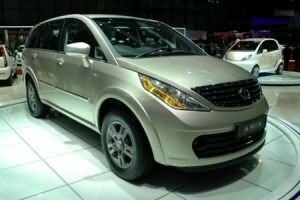 Tata Aria has been launched by the ace auto company in India. It is designed with luxury features and is made so as to compete with other cars in its segment like Innova and Scorpio. The new Tata Aria has a 2.2 litre DICOR CRDI diesel Engine with dual mass flywheel under its bonnet that generates a power of 140 PS and a torque of 320 Nm from its new Mark II gearbox. This 4×4 car from Tata comes in three great varients i.e. Pride, Prestige and Pleasure. The car is equipped with a GPS Navigation system allowing the driver for better guidance. It also comes with features like Electronic Stability Programme, Traction Control System, etc. The Tata Aria has some good safety and comfort features as well which include Six airbags (driver, front passenger, side and curtain airbags), ABS with EBD, Darkness Sensing Lights, Driver Information System, Automatic Climate Control, Premium leather upholstery, three-row theatre style flexible seating, Electrically adjustable and retractable ORVMs, Reverse Guide Camera, steering mounted phone and music control, etc. In term of Design and styling Aria is one the best looking products from Tata after the Indica Vista. On first glance, the huge, beefy looking Aria dwarfs everything this side of the Toyota Fortuner, leave alone the Toyota Innova. Huge seventeen inch wheels with disc brakes all around give the Aria this imposing stance. The front end of Aria looks very similiar with large sized headlamps, large chrome finished front grille and large front bumper with huge airdam flanked by round front fog lamps on both sides. All in all Aria looks very balanced and proportionate in comparison to Xylo and Innova. The rear again is very similar with vertical tail lamps like we have seen in the Indica V2 and Indica Vista. But the fit and finish of Aria is a notch up in comparison to other Tata products. When viewed from side Aria looks very huge and the different shaped rear quarter glass give it a modern and up to date look. The front grille of Tata Aria is finished in chrome which give it upmarket look, overall fit and finish and paint quality of Tata Aria is comparable to Toyota Innova and can give a run for its money. Tata Aria is even better than Innova if we compare the overall design and styling elements of Tata Aria. The Tata Aria can easily seat 7 people in it. Length of Tata Aria is 4780mm, width is 1895mm and height is 1780mm. Tata Aria has a seating capacity of seven passengers and all are comfortable, all beacause of Tata Aria’s huge wheelbase of 2850mm and overall ground clearance of 200mm also lends off-roading capability to Tata Aria. Tata Aria is bigger than Toyota Innova in all respects and hence proves to be much more comforable with more legroom and headroom. Like the massive exterior, the Aria’s interiors has huge space which has become a feature of most of Tata Motor’s products. That apart, the cavernous interiors are very decently appointed and feature rich. A brief the features include air conditioning vents for all the three rows, foldable food trays, roof mounted glove boxes and beige interiors. It also features steering mounted audio and telephone controls. The vertical shaped air con vents looks very cool and different. The quality and fit/finish of materials used is by far the best in comparison to other Tata products. The very innovative and space saving storage is roof mounted glove boxes which are first of its kind and we have never seen in any other multi utility vehicle. The second row of seats are fully adjustable and are very comfortable. But the third row is only confined for children or only for short trips for adults. Aria also features bluetooth enabled dash integrated MP3/DVD music system with factory fitted 6 speakers. The instrument cluster consists of the speedo, odo, temperature gauge and fuel gauge with other tell/tales which are easy to read. On folding the middle and third row of seats, you get a large flat loading area for your luggage. Even with all the seats in position the boot space is quite decent. Tata Aria is available in three variants. Base variant Aria Pleasure, then Aria Prestige, then Aria Prestige Leather and top of the line Aria Pride. Here are city wise prices of Tata Aria in 5 major cities of India, these prices are in rupees and are ex-showroom. Local levies, entry tax, road tax, registration, insurance etc. are exclusive of these prices. The engine is the same 2.2 liter DICOR diesel unit that powers the Tata Safari and this certainly endows the Aria with sprightly acceleration and decent cruising speeds. The engine generates maxaimum power of 140 Bhp with maximum torque of 320 Nm. The ADAPTERRA Torque on demand four wheel drive system monitors traction available at each wheel and supplies torque to the wheel with maximum traction, Off road capability of an SUV, Automatic Level ride control keeps the suspension stable, irrespective of the vehicle load, Hill Descent control system and also features Limited Slip Differential. – Six SRS Airbags along with Traction control with Cruise control. Active safety features of Tata Aria: All four wheel disc brakes, Reverse guide system, Six airbags-driver and front passenger, front side and curtain airbags. – Reverse camera with display on GPS system. All Disc Brakes: The Aria is equipped with disc brakes on all four wheels for efficient and powerful braking. The dual pot calliper braking system ensures high braking force and shorter braking distance. ABS with EBD: During panic braking or while braking on slippery surfaces with normal brakes, the vehicle goes into a skid and the steering becomes unresponsive, thus resulting in an accident. The Aria is equipped with an Anti-Lock Braking System along with Electronic Brake Force Distribution. The ABS system prevents the brakes from locking. This ensures that the tyres retain traction and steering remains responsive, thus preventing accidents. ABS is effective even on slippery surfaces such as wet roads or ice. The Electronic Brake force distribution distributes the brake force as per the dynamic requirement sensed for each wheel while braking. This increases braking efficiency and shortens the braking distance. ASP with TCS: One of the most important features in the Aria is the Electronic Stability Program (ESP) and Traction Control System. ESP is a computerized system that improves stability of a vehicle and prevents skidding / toppling in situations of loss of steering control. ESP intervenes only when it detects that the vehicle is not going in the direction where the driver is steering it. This may happen when the vehicle is skidding during emergency evasive swerves, under-steer or over-steer during poorly judged turns or on slippery roads. ESP estimates the direction of the skid and then applies brakes to individual wheels asymmetrically to prevent the skid and restore steering control. Traction control system functions in a similar manner and maintains stability in situations of sudden acceleration. Body Over Frame Construction: Aria is one of the few crossovers in the world with a body over frame construction. This construction provides the car the rigidity and robustness required for Indian roads and multi terrain operation. Moreover, Aria’s chassis frame members are made through a new generation technique called hydroforming which makes the frame lighter, stronger and more rigid. Airbags: Aria is the first Indian car to be armed with – 6 full surround airbags. The Driver and Passenger Air Bags get self-inflated within milliseconds depending on the severity of the frontal collision. The Side Air Bag and Curtain Air Bags assure complete protection on all seats in case of sideways collision or rollover. By forming a safety cushion for all passengers, these Air Bags reduce the likelihood of injuries in a collision. Seat Belts: The front seat belts are equipped with a pretensioner which restricts forward movement in the event of a frontal impact. Keyless Entry: In case of theft or bonnet/ door opening attempt, the in-built immobilizer with Parametric Alarm System not only alerts but also cuts the fuel supply to the engine and will only start with the original key. Low Floor Construction: The off roader in the Aria exists in perfect harmony with its comfortable car avatar. Aria’s unique design combines low floor construction along with enough ground clearance. This makes entry and exit extremely easy, resulting in a car you can walk into not climb up or get down in. Infotainment System: The Aria is equipped with a sophisticated infotainment system. It includes a state-of-the-art 2 DIN integrated music system with 6 speakers, which plays CD and MP3. It also features a speed sensing volume controlling device, a USB port for external storage and an auxiliary input jack for portable music players such as IPods. The system also has an in-built Bluetooth connect which allows you to pair up to 5 mobile phones. That is not all; you can operate the music system as well as the phones without taking your hand off the steering thanks to the remote switches provided on the Steering wheel. The Aria’s infotainment system is named that way because, along with entertainment it also provides the driver with a range of useful information such as inside/outside temperatures, distance the car can travel on available fuel, instant and average fuel consumption, and other alerts related to performance and efficient control of your Aria. To top it all the system is absolutely secure as it is equipped with an Anti-theft protection feature. GPS Navigation System: The Tata Aria is one of very few vehicles which come with an in-dash Satellite Linked Navigation System and preloaded maps of most Indian cities. Apart from directions to your destination you can also search for the nearest restaurants, Banks, hospitals. And should the need arise the system will guide you to the nearest Tata Motors dealership. Dual Climate Control ACs: The Aria is equipped with extremely efficient dual air conditioning with automatic climate control system. This enables you to set the preferred temperature which the system maintains inside the cabin. A large number of well positioned vents on the dashboard pillars provide the required cooling for all passengers. Reverse Guide System: The Aria is equipped with an in-built reverse guide camera. Whenever the reverse gear is engaged, the screen mounted on the dashboard will come alive and display a live view of the rear of the vehicle. The Reverse Guide System assists you in detecting otherwise invisible obstacles while parking or reversing. Auto Wipers & Auto Headlamps: The Aria goes to great lengths in minimizing driver effort and intervention and conserving energy. Like the intelligent Rain Sensing Auto Wipers and Darkness Sensing Auto Head Lights. During rains the sensor on the dashboard automatically activates and operates the wipers in the suitable speed mode depending on the intensity of the rain. Similarly, they also automatically sense low light and activate the headlights. Driver’s Seating: The Driver’s seat in the Aria is specially designed for a comfortable and pleasurable driving experience. The seat is adjustable 6 ways which includes height adjustment to facilitate an optimal driving position. The driver’s and co driver’s seats have arm rests that can comfortably adjust to any position. And that’s not all; the adjustable lumbar support provides support to the lower back particularly on long journeys. The comfortable seating position is complemented by a height adjustable seatbelt. This ensures that the driver is securely fastened to the seat, irrespective of his height. Tiltable Steering: The steering wheel tilt can be adjusted to an angle that best suits your driving position. This further helps in ensuring the most convenient steering position for you. ORVMs: The Aria’s outer rear view mirrors are both electrically adjustable and foldable. Thus the driver can operate and adjust both the mirrors without ever having to lower the window glass. Sunvisor Extenders: The Sunvisors are provided with extenders to help block the afternoon sun. The co-driver’s sunvisor has a vanity mirror with an in-built light that switches on automatically. Glove Box Chiller: The Aria’s glove box does away with the old perception of glove boxes as the hiding places for papers and sundry items. The Glove box in Aria is fitted with a chiller which keeps your beverages & chocolates cool. A light has also been provided in the glove box that is automatically switched on as soon as you open the glovebox. Puddle Lamps: To make sure you step down safely, every Aria is equipped with a puddle lamp at the bottom of each door. This lamp illuminates the ground below as you open the door in the dark, thus preventing you from accidently stepping into a puddle. Follow Me Home Lights: The Aria assists you in locating your way as well as locating the Car in the dark. Even when the Car is locked, the headlights can be put on from outside with the approach light switch on the remote key and it stays on for 60 seconds. This can help you in locating your way after parking in a dark spot. It can also help you locate the Car in a big parking lot at night. Bonnet Autolift: The Aria’s bonnet is equipped with hydraulic balancers which automatically lift the bonnet once the lock is released. Automatic Rear Wiper: During the rains, whenever the reverse gear is engaged the rear wipers start automatically (provided the front windshield wipers are on). Power Outlets: The Aria is equipped with separate 12V power outlets for all 3 rows allowing you to conveniently charge your cell phone wherever you are seated. Flexible Seating: The Aria provides one of the most spacious interiors in its class of vehicles. Even after 3 rows of seating you still have ample luggage space at the back. The flexible seating further ensures that you make maximum use of the vast space provided inside. The 2nd row has a 60:40 split and the seats can be independently flat folded or tumbled. They can also be slid back and forth to create extra leg space for 3rd row occupants. The 3rd row can also be flat folded along with the 2nd row to provide a long flat bed. The split fold facility in the 2nd row when used with the folded 3rd row, can be used to store longer items such as bicycles or kayaks. Utility Bins: The generous proportions and stylishly designed interiors create an exclusive ambience in Aria. The unique roof utility bins offer a lot of storage place for all the occupants to keep their CDs, Planners, Glasses, Digicams, Binoculars Maps, Novels, etc. Suspension: The perfectly balanced suspension in Aria not only assures you a comfortable ride but also gives you efficient control and stability on or off the road. Aria is equipped with an independent double wish bone suspension in the front and 5-link suspension at the back. The suspension has been designed and set-up to provide an optimal balance between a comfortable on-road ride and surefooted off-road handling. Not only does it absorb shocks from the most uneven roads, but it also reduces roll to a minimum and helps to inspire confidence on the sharpest of corners. Adapterra 4×4: Aria is equipped with a selectable 4×4 which has a built in Adapterra torque on demand feature. Engineered for an instant response, this is the latest technology in 4X4 systems. It senses and distributes torque, in varying proportion to the wheels, in accordance with the terrain. Thus even if two wheels are on a slippery surface, the Adapterra reduces torque to these wheels, thereby preventing any wheel spin. The Adapterra also helps to maintain stability on winding roads. Steering: The Rack & Pinion Steering in Aria is extremely precise and effortless to operate. This power steering delivers excellent high-speed stability and enhanced control thereby making it easy for you to manoeuvre on narrow winding roads. 2.2 DiCOR Engine: The 2.2 DICOR engine has Variable Turbine Technology, 16 valves & Twin Overhead Camshaft with 32 bit ECU, generating 140 PS Power & 320 NM Torque. Then there’s also the Dual Mass Flywheel that makes vibrations a thing of the past, maintaining a peaceful calm inside the cabin. A boon on Indian roads, we think. Putting the reins in your hands is the new Gearbox (Mark II) that’s perfectly synchronised with the engine, offering smooth power delivery, and crisp gear shifting. Headlamps: The sleek dual barrel crystal headlights grab attention where ever you go; especially at night when the halogen bulbs can be seen from a long way off, ushering in the arrival of this sleek and sturdy set of wheels. 17″ Alloy Wheels: Apart from dazzling in the sun as you roll down the highway, the Aria’s Alloy wheels are lighter and stronger, than normal steel wheels. Dashboard: With a dashboard that’s as stylish & practical as the Aria’s, you feel like you’ve got the whole world at your finger tips. Pillar Mounted AC Vents: In order to ensure that you get the perfect environment that you deserve, the AC air vents are strategically placed to acclimatise the whole car evenly. Chrome Finish Door Handles: These shining chrome handles make you feel proud to own the Aria, every time you enter or leave your car.